As a third-generation refugee born in Jabalia Refugee Camp, in northern Gaza Strip, I have grown up with scenes of horror and injustice surrounding me since I was a child. Experiencing such trauma firsthand shaped my consciousness about our oppressive reality, and my place within it, from a very young age. My political and social activism has always been driven with a desire to fight alongside the oppressed for justice, which evolved naturally from our day-to-day challenges under the occupation. I refused to dwell as a helpless victim stuck in a circle of victimhood, and decided to deploy my energy to protest surrounding oppression, which I found very empowering. To be sure, no single Palestinian can be said to feel what most other Palestinians feel: ours has been too various and scattered… But there is no doubt that we do in fact form a community, if at heart a community built on suffering and exile. Suffering and exile has become the thread that united the population of Palestine as a collective, due to our seven-decade encounter with Israeli settler-colonial Zionist state, which is based on the negation of Palestinians. Gaza, however, has been a more drastic example: Gaza has been subjected to systematic ghettoization process and consistent Israeli violence since its ‘War of Independence,’ an event we, Palestinians, commemorated as al-Nakba (the catastrophe) which marks our dispossession, our ethnic cleansing, and the destruction of historic Palestine. Palestinians experience Nakba as an ongoing process since 1948, of which we collectively bear its traumatic traces. This has left no family in Gaza without at least one relative killed, wounded, detained or exiled; my family is no exception. My great-grandfather was shot dead in front of his home in our original village Beit-Jerja, which was completely flattened, and emptied of its indigenous population in 1948. My grandparents sought refuge in Gaza, and have lived there ever since as refugees. My father spent a total of 15 years of his prime as a political detainee in Israeli jails, a story that Israel made common among Palestinians, with detention being randomly used to deter the Palestinian resistance. Moreover, numerous relatives were either killed or sustained a permenant injury, or had their houses turned into rubble in the Israeli periodic attacks on Gaza. My childhood, like the rest of Palestinian children, was not ordinary, and was deprived of the basic security needs that any child has a right to. My memories of the Second Intifada (uprising) which erupted in 2000 remain vivid, though I was only nine years old; the sounds of bombings started echoing louder and louder across the Gaza Strip; the news became full of blood, destruction and traumatized victims; walking alongside flattened houses, buildings and victims’ green funeral tents became a daily occurrence that I experienced while traveling back and forth between home and school. I was 17 years old when Israel launched the 22-day offensive against Gaza’s population in 2008-9, which it named as ‘Cast Lead’, declaring the start of a series of attacks, or ‘mowing the lawn’ in Israeli parlance; we experienced mass killing and destruction. Surviving this massacre marked a turning point in my life; that’s when I started my writing career in the form of citizen journalism. I recall the sleepless nights I suffered as Israeli missiles lit up the sky and shook the house every minute, when I sat with eyes open wide, in darkness, which made my sense of isolation from the world more horrifying. I remember one night I sat surrounded by my mother and siblings in one small room under one blanket, with the rest of the house crowded with dozens relatives and friends who escaped their dangerous neighborhoods. No voice could be heard, just heartbeats and breaths getting heavier every time another bombing was heard. Suddenly, my father opened the door rushing us to “leave home now,” following a bomb threat that our next-door neighbors received. I remember how my siblings and I grasped my mother’s hands and started running outside, unconsciously, barefoot. For three days we stayed in a house nearby, powerless as we sat, waiting to be either killed, or wounded, or forced to watch our home flattened. At least 1,417 men, women and children were killed in this attack and the rest of those who survived continued a daily struggle for survival, and waited for inevitable Israeli attacks to follow. I was among those who survived but what if I was one of the fatalities? Would I be buried, nothing left of me but a picture on the wall that is bound to fade away, or a name that would eventually get lost amongst the increasing victims whose lives are constantly reduced to numbers in media coverage of Palestine? These were questions that haunted me after I became, yet again, a survivor of another Israeli form of collective punishment. I refused to dwell on that thought. That’s when I started writing to raise awareness among the international community about the Palestinian struggle for justice. I believe that the Palestinian anti-colonial struggle is beyond the call for justice, freedom, equality, and the right of return to Palestinian refugees, but it is also about decolonizing the world’s cultural discourse on Palestine, which is largely shaped by Israel’s narrative. The lack of Palestinian voices from Gaza who could connect to the outside world motivated me to start my English-language blog Palestine from My Eyes. Since I started blogging in 2010, it has become my platform where I write Palestinian stories that reflect not only our daily struggles, but also our aspirations and our resistance and everlasting determination to maintain an ordinary life amidst extraordinary situations. My blog became, to me, a tool of self-representation, documentation, education and mobilization. It allowed me to reach out to the world, remind them of the forgotten and speak out the unspoken. It allowed me humanize our struggle by putting faces and personal accounts to the numbers that international media report. It has become my means of celebrating our cultural heritage against Israel’s continuous attempts to appropriate our culture and deface any traces to Historic Palestine. Through my blog, I was able to elevate the voice of the voiceless, to highlight marginalized issues, such as the plight of Palestinian political prisoners and highlight daily challenges that the population of Gaza’s ghetto endures from power and water cuts, to restricting freedom of movement, most of which go unreported in international mainstream media. Upon the start of my writing career in Gaza, I found in journalism a window from our open-air prison to the world whose knowledge of Palestine, if there is any knowledge, is usually confused. This was to be expected given the prevalence of Israel’s narrative and rhetoric of self-defence within Western mainstream media, which tended to present Israel as the underdog and Palestinians as the offenders. Through Palestine from My Eyes, I was able to create a counter-narrative that challenges this misinformed media discourse around Palestine. Media platforms have been misused to turn misrepresentations into facts, manipulate events, create prejudices and legitimize illegitimate actions for the interests of the powerful. Israel always accompanies its military campaigns against Palestinians with a formidable propaganda campaign, based on misrepresentations of reality, that enables Israel to carry out crimes against Palestinians before the eyes of the whole world with minimal criticism. Western media, with Israel being an important ally, has tended to uncritically disseminate the Israeli narrative of ‘truth’, contributing to generate public endorsement and support to its ideological and political aims. In this narrative, the immediate and long-term impact of Israel’s colonial history, its military occupation and its periodic onslaughts on Palestinians is usually stripped out of context. The Palestinians are further disadvantaged for lacking a unified, official Palestinian media strategy, which makes the individual efforts become more crucial. Therefore, I believe, journalists of conscience hold a duty to reject being used as a tool in the hands of the strong and shape the public opinion for their benefits. Instead, we should use our voices to defy power structures to make sure we move towards a fairer world based on principles of equality, anti-racism, anti-oppression, and anti-sexism. 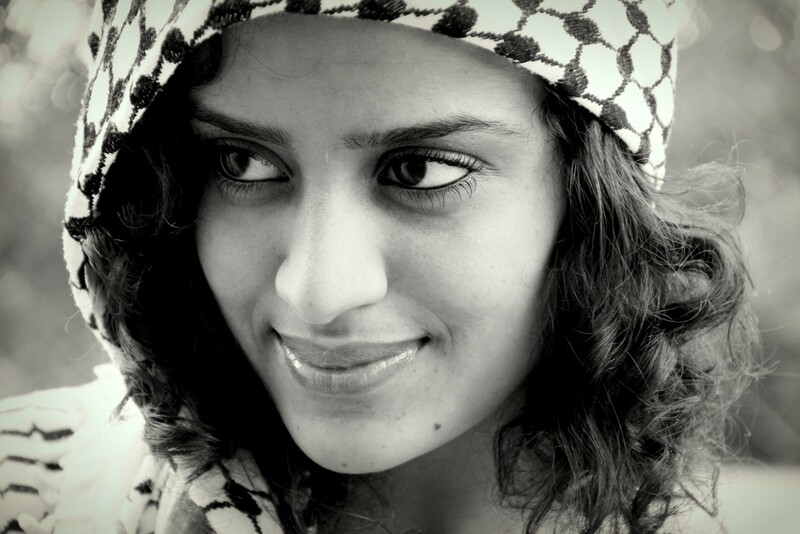 Bio: Shahd Abusalama is a Palestinian feminist writer, journalist, and artist, born and raised in Jabalia Refugee Camp, in Palestine’s northern coastal enclave of the Gaza Strip. She holds an MA in Media and the Middle East from SOAS, University of London. Shahd is the author of Palestine from My Eyes, which is reproduced at the Electronic Intifada, and was published as a hardcopy in Italian in 2013. She can always be followed at @ShahdAbusalama. Are you on facebook?? is there a better way to contact you ?? Keep it up for our beloved city..
you are a talented writer and artist. Thank you for sharing. Monique from Australia. hey … my name is Omar and I am in charge of a Palestinian group in vancouver and I have a group of Palestinians here who are eager to help … please email me with anything I can do.. literally anything. Your intelligence, talent and courage are humbling and inspiring. Shahd, thank you for the list of names. We will slowly carry them with dignity through our city in Canada December 8, and we will read them one by one. Thank you so much for your extremely valuable work in chronicling the details of this cruel assault. We are referring people to your work and will be linking to it on our website. There is just one small typo you might want to correct: you say “After the truce was endorsed at 9:00 pm on late Wednesday, December 21, Israel has violated the truce continuously.” — obviously, you meant November. You can see an ad we created at http://alisonweir.org/journal/2012/12/16/advertisements-in-new-york-times-and-beyond.html . Again, thank you so much for your work. It is deeply sad and profoundly valuable. Very few people,on the World and in particular among the vectors of opinions and /or decisions, know enough the ” important details ” of what passed in New York, in Washington and in Tel Aviv, and also in Paris, between if only on May 15th, 1947 and May 15th, 1948. And you, brave and courageous woman ? Bring some comfort to the present, it is very well, but, if that preserve it , that does not prepare the future if we down know the injustice and the incoherence of past. ciao Shahd I am Robi italian,i m in love of the your beautiful country,not it cares that it speaks of Gaza or of Tel Aviv, I am in love of it. We don’t simply give the guilt to one or to the other part,it needs to understand that it needs to find the peace.. and pain is stronger when it speaks of children that have put in mean. I would like sentirti,dalle your words to understand the situation. I know that there are today also continuous attacks… from everybody and two the parts…. We are loyal followers of your work at Fallujah Magazine (an online publication that deals with Poetry/Art + Protest), and we wanted to invite you to contribute to our project. It goes without saying that we would be profoundly honoured. You can check our publication at http://www.alfallujah.org and contact us at art.fallujah@yandex.com or the director directly (haha) at aragon@alfallujah.com . We have an entire section dedicated to Palestine and are searching for voices to make it a relevant peaceful protest project. We are barely in the process of being born and so we need all the help and material we can get. Anyway, would not dare take more of your valuable time. Whatever the road may be from now, please make our sincerest admiration yours. Here at ‘Welcome to Palestine’ we are developing the largest online encyclopedia of Palestine http://www.welcometopalestine.com/about/ . We are looking for passionate writers to write diverse and interesting pieces on all aspects of Palestine and Palestinian life. We would very much like to discuss further what our project is about and whether this is an interesting prospect for yourself. Thanks for getting in touch, and sorry about the late reply. I’d be very happy to have a chat with you about your project and discuss how I can contribute. Feel free to email me at sh.abusalama@gmail.com.